Qatar lifted the Asian Cup for the first time after the Asian Football Confederation (AFC) earlier dismissed a protest about the eligibility of two of their players. Sudan-born forward Almoez Ali, one of the players in question, opened the scoring in the Gulf state's 3-1 final win over Japan as he finished the competition as top scorer with a record nine goals. The protest, made by the United Arab Emirates' football association a day after Qatar beat the UAE 4-0 in a heated semi-final on Tuesday, also involved defender Bassam Al Rawi. Al Rawi, who was born in Iraq, and Ali each played the full 90 minutes of Friday's final at the Zayed Sports City Stadium in Abu Dhabi. According to documents that have been published on websites in the UAE and elsewhere, the mothers of Ali and Al Rawi were not born in Qatar, as has been claimed by the Qatari federation, so neither player is eligible for selection. "The Asian Football Confederation Disciplinary and Ethics Committee on Friday dismissed the protest lodged by the United Arab Emirates Football Association over the eligibility of two Qatar players," it said. It did not respond to questions about how this decision was reached or if the UAE, or any other party, has the right to appeal against the decision. Several UAE websites have suggested that this case is likely to end up at the Court of Arbitration for Sport in Switzerland. Qatar's unblemished progress through the tournament has been played out against the backdrop of an 18-month diplomatic crisis that has left the hosts of the 2022 World Cup very isolated within the region. Initially, 12 governments joined the diplomatic and economic blockade of Qatar, with the key players being Bahrain, Egypt, Saudi Arabia and the UAE - a situation that has left Qatar with a closed land border with Saudi Arabia and no access to the air space and sea lanes of its closest Gulf neighbours. This year's Asian Cup, then, was always going to provide a proxy battleground for this dispute and so it has proved. It started with the UAE trying to prevent senior Qatar federation official, and AFC vice-president, Saoud Al Mohannadi from attending the tournament, only for the AFC to intervene on his behalf. Five Qatari sports journalists were also denied entry visas. 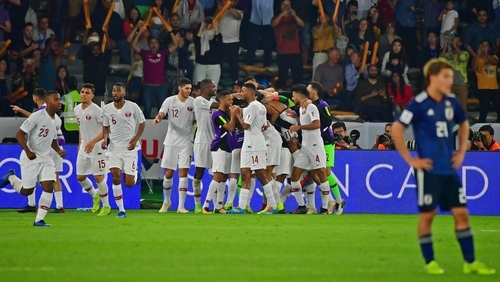 Having beaten Saudi Arabia in a bad-tempered group-stage game, Qatar claimed 1-0 wins against Iraq and South Korea in the knockout stages to set up the semi-final against the UAE - a grudge match that saw home fans pelt the Qataris with shoes, an insult in the Middle East, and bottles.